I am in love with anything to do with the beach or the ocean so this image really appealed to me. I Googled seahorses and other than a bright yellow of some, they are mostly pretty boringly coloured so I decided to take artistic licence and go with some fun, ice cream-ish colours to go with my Kioshi DP. However, when I started looking through the pad, I realized that though the colours were perfect, the geometric nature of the prints wasn’t organic enough for this underwater scene. So I went with this cool ‘bubbley’ print from another Basic Grey DP pad, Pheobe. Just right! I used a sketch by Skipping Stones Designs for this card. I flipped it then changed the partial circle shape into a rectangle, mimicked the scalloped edge with the scallops on my sentiment panel and added an extra shell to represent the circle on the sketch. I airbrushed the background with ‘waves’ of BG75 and B91 but you can’t really see the ‘waves’ because they are too subtle. Maybe next time they will show up better if I make them each wider. Overall, I like the look of the background though. The ‘seaweed’ is felt cut with the regular PTI rickrack die. It cuts though felt like buttah! 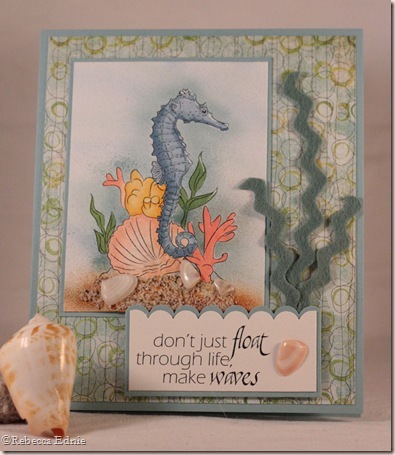 The sand is a cool product I picked up at CHA, sand mixed with glue that is spreadable on your card or project! Way cool! They had lots of colours that corresponded with the colours of sand on various beaches across the world. And they also had shells with glue on them too! It is such an easy product to use and not too expensive either at $5 for sand and $6 for shells. It seems to go a long was so it was well worth it. I’ve wanted an easy way to add sand to my projects for ages! I was also surprised when I discovered seahorses were kinda bland colours. I prefer your artistic interpretation. Really great choice of colours and materials. Great use of a ric-rac die to make sea-weed! That takes some imagination! Love the shells and sand too. WOW, WOW, WOW! The soft beautiful colors, and the ric-rac for seaweed is genius! Another fabulous vintage design! Wow I love everything about this card! Love your coloring, the seashells and the ric rac! Beautiful card! Thanks for joining us at Skipping Stones Design! super cute!! love the ric rac for the seaweed!